It was hard to know what to make of Clips at launch. Sure, Apple launches its own standalone apps from time to time, but it’s never offered up anything quite like this. For Apple, Clips is another play at mobile video editing — a dead simple solution for those who don’t have the time, skill set or desire to fiddle with Final Cut or even iMovie. From the outside, there are some unavoidable shades of Snapchat and Instagram stories. 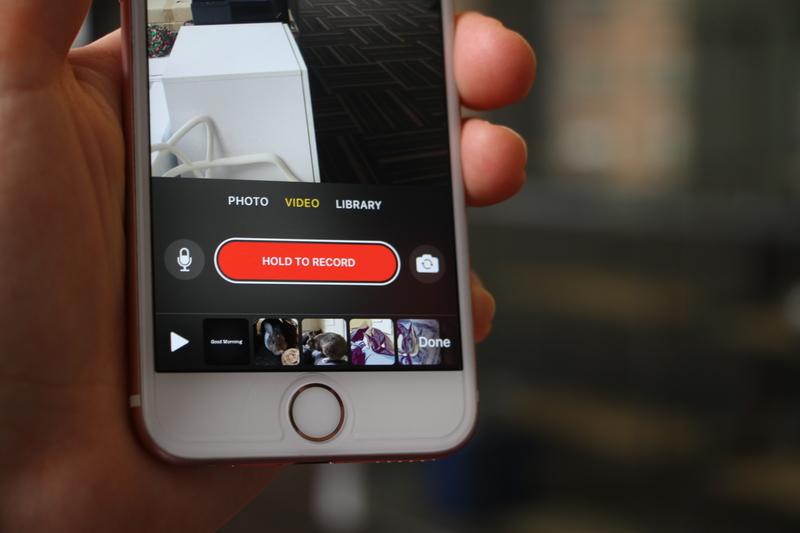 Clips lets users cut together short videos and photos, add filters, emojis and music and send them out into the world — albeit without a standalone social network attached. That’s by design, both to keep the app from being locked to a proprietary platform and because, let’s be honest, who wants to build yet another Snapchat/Instagram-style social network in 2017? The reality is somewhere between these two camps. Clips does offer a super simple way to pull together videos and images into a single cohesive package you can fire off across a slew of media accounts (and most importantly, for Apple, Messages), leveraging the company’s existing editing software in the process. 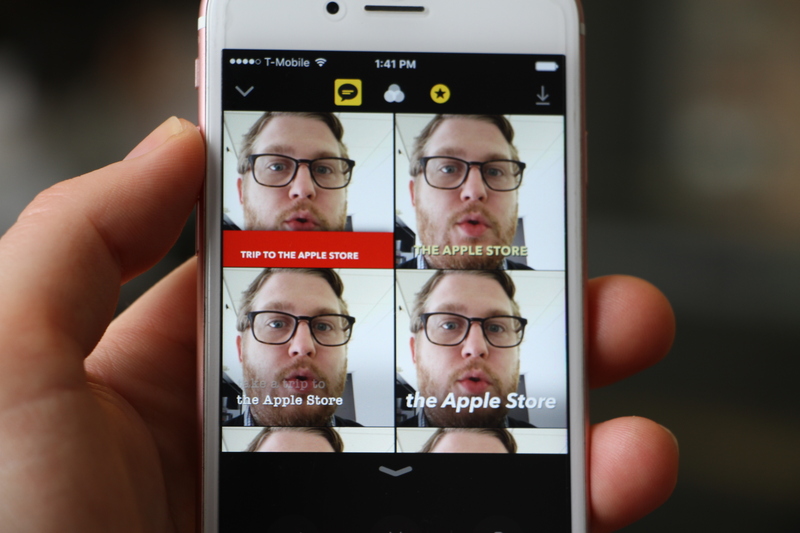 Between the package, the press material and the sort of supplementary stickers and emojis Clips features, it’s pretty clear the company is aimed firmly at Snapchat and Instagram’s largely millennial user base. For Apple, it’s a way of showcasing the company’s focus on camera hardware and editing software, while potentially breaking users out of existing social ecosystems, in favor of its proprietary offerings. Clips delivers on the ease-of-use front. Apple’s gotten very good at building a dead simple interface. That’s thanks, in part, to the fact that unlike Final Cut and iMovie, Clips was built from the ground up as a mobile app. That means no porting, no jamming square pegs into round holes and no legacy pieces. The company clearly started with the most basic elements necessary for the experience and only added one where it felt necessary. That means that some features are lacking in this earliest-stage version of the app. While it’s built to offer the shortest route from shooting to firing off an edited video package, a certain level of customization gets left in the process. Though I suspect that Apple would likely tell me that iMovie or Final Cut is more my speed. The upshot of simplicity is there’s really no baggage to weigh you down. The center of the app is a live view of the camera (tellingly in selfie mode by default). Below that is a long red button that literally has the words “Hold to Record” on it. You hold that button to record, FYI. Clips is really a camera app with some base-level post-processing built in. Above the view finder are a handful of buttons for adding captions, switching filters and adding emojis/stamps and titles. Below it are options for toggling between video, stills and pulling images from your phone’s library. The big red record button is the focal point for the whole undertaking, in more ways than one. Everything that goes into the timeline on the bottom needs to go through that button first — even the title cards and stills. You add it into the video by holding it down for the duration of time you want it in the final cut. Live Titles is far and away the standout feature here. The add-on is the culmination of a lot of behind the scenes work by various Apple teams. Few of the pieces, it seems, were developed specifically for the feature, but taken together, they result in a simple piece that adds a lot to the overall Clips experience. 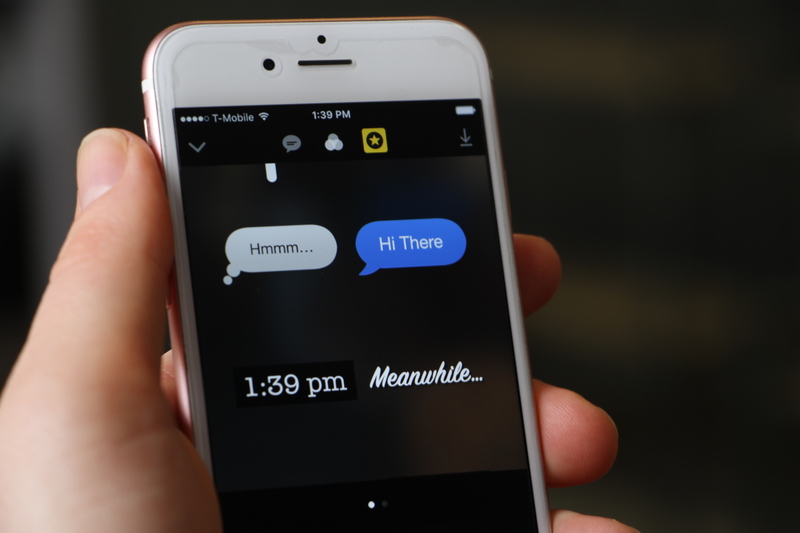 Using voice to tech technology, the app is able to add captions to video in real time in eight different text styles. It utilizes iOS Dictation and requires an internet connection to work. The feature also offers a pretty key insight into the key use case Apple sees for Clips — namely sending personal messages. Along with a number of Messages upgrades rolled out in iOS 10, the app is designed to complement Apple’s SMS system, adding a little more flare to the text-based messaging system with little snapshots of a person’s day. That, no doubt, is also a big part of the reason why the camera defaults to selfie mode. Live Titles does a pretty solid job capturing text. Though there are some caveats. You’ll need to speak loudly and clearly and enunciate. If you speak too quickly or mumble, it tends to mishear or omit words. Also, make sure you’re in an environment with as little ambient noise as possible. Trying it out in front of the Grand Central Station Apple Store, things didn’t go great. It also doesn’t work with multiple voices. As the company handily points out, it’s really more of a narration tool than anything, and thus well suited to the format. In its present offering, the filters feel a bit limited, with only eight in all. And certainly they’re a ways from the intricacy of augmented reality offerings from the likes of Snapchat. The current Clips offerings build upon Apple’s existing photo filters and add a few new novel selections, like Comic Book, which does a good job turning live video into a pulp-like image. The offerings are still pretty limited on the filter front, but Apple will no doubt be adding to them soon. There’s more variety on the stamps front, with a dozen stylistic offerings, some of which default to the location, time and date where the video is being shot. It’s not wholly inherent in the UI, but you can edit these directly after they’ve been added to a specific video segment by holding down on the text. Same goes for emojis. By default, the app offers up your 30 most frequently used. You can add others, as well, but in order to do that, you’ll need to choose one of the top ones and then click into it, bringing up the emoji keyboard. Once added to the video, the image can be dragged around the screen, rotated and adjusted for size. The other key piece in the equation are title cards. These add nice book ends to the video and give it a bit more of a professional vibe — a nice feat for something you’ve probably spent >5 minutes creating. And like the stamps, Apple has clearly put a lot of work into creating a smooth experience here, which, taken together, makes for a nice little package. Some of the features feel a bit hidden for the sake of simplicity. I reached out to Apple in the early version I tested, but the company says that when the app goes live today, there will be a help section to walk users through the steps. So, that ought to improve the experience a bit. Adding music is similarly straightforward. The app comes with a few dozen music beds that really run the emotional gamut. You’ll need to download them to add them to a video — this is no doubt an effort to keep the app’s total size down. But it’s a nice little feature, like building a royalty-free music library directly into a video editing app. And bonus, the company even tapped action-score god Hans Zimmer to create a sufficiently tense piece of music. The app also does a nice job looping music automatically and seamlessly, so it feels like one continuous soundtrack up to the Clips’ 30-minute length cap. That said, users can’t actually cut music out of specific scenes. Once it’s added to a clip, it’s added to the whole thing. Though it will automatically lower for those scenes with audio. For the rest, it’s best to mute the video’s audio and just let the soundtrack take over. Users also can pull in their own music using purchased music in the iTunes library. It’s a nice feature and also a potential avenue for monetization with the free app. 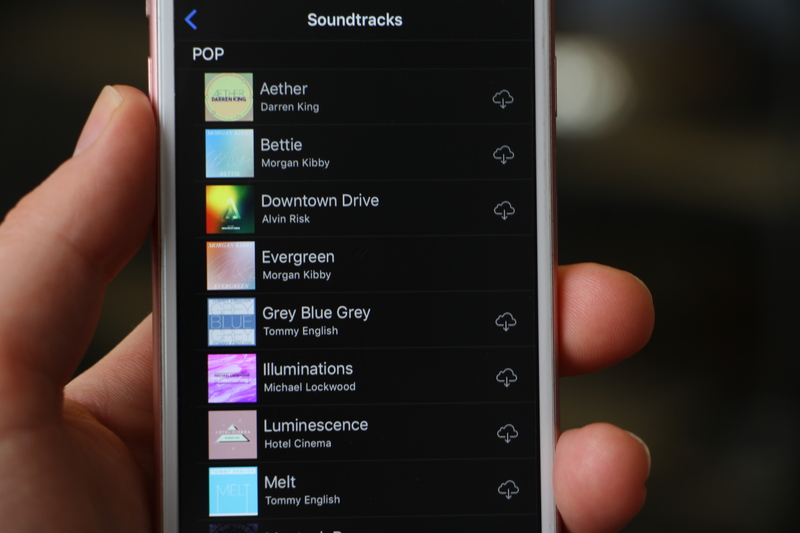 It’s almost a sneaky in-app purchase feature, driving music downloads. Everything that gets recorded appears on a timeline on the bottom. Each segment appears as its own square, which users can rearrange directly in the timeline through dragging and dropping. Tapping into one brings you into the clip. From there, you can further fiddle around with filters and the like, mute the audio, trash it or edit it for length by clicking the scissors icon. Actually, “trim” is probably a more accurate description. When you click through, the segment shows up as its own visual timeline, similar to what you’ll see in an iMovie. From there, you can drag the arrow on either side to shorten the video. The Clips are exported at 1080 x 1080. The square format is in keeping with other social media output, designed, among other things, to be shot in portrait mode — yet another piece of insight into the intended audience here. It also, perhaps, offers a peek into a potential new aspect ratio for iPhones moving forward that could be more accommodating to two square images placed side by side, like the 18:9 or 18.5:9 we’ve seen on the new flagships from LG and Samsung, respectively. The videos can be shared on any platform that can handle the MPEG format, and, by default, it features share buttons for Instagram, Facebook, Vimeo and YouTube. And Messages, of course. That one’s up top, with contacts prioritized by frequently contacted, along with contextual information grabbed from the video, like names in the text. That sort of Messages sharing functionality is new for Clips, but you can likely expect it to be rolled out to other Apple apps in the near future. Apple told me it will be “updating the app regularly,” so expect those filters to be updated soon. I also wouldn’t be too surprised to see the company open up the app to third-party support, allowing developers to create their own additions. And perhaps, the company will offer additional premium content, helping it further monetize the free app. For now, however, that’s all still speculation. Also interesting is the fact that the company doesn’t have immediate plans to bundle the application with any hardware, unlike a slew of other Apple apps that currently ship with devices. If nothing else, it seems to point to the company viewing the app as a bit of fun, rather than an essential piece of software. There aren’t any real differences between the iPhone and iPad version of the apps, though the company is positioning the tablet version a bit different, offering a quick and easy way to make presentations for classrooms using the tablet. 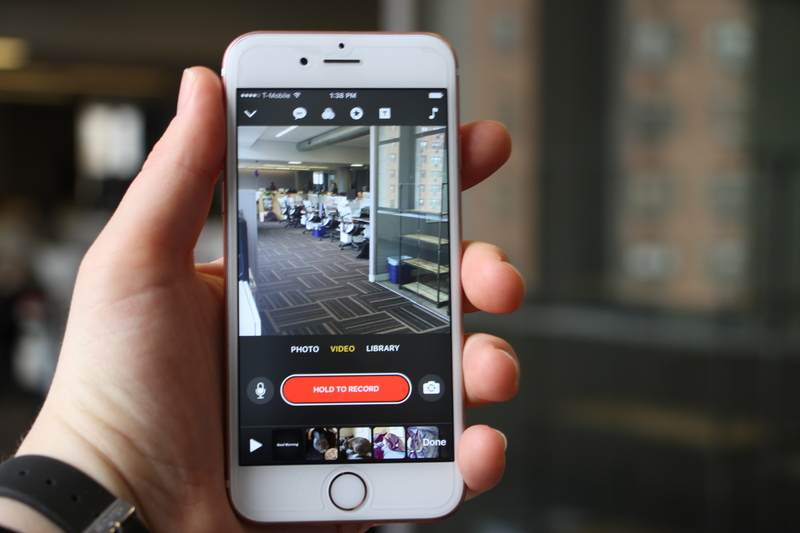 It’s easy to see how the app might have a second life as a simple video editing solution for education, though some ed-tech specific content packs would go a ways toward improving that experience. As it stands, Clips is mostly about simplicity and a little bit of fun — neither are bad goals in and of themselves, but it will be interesting to see where the company eventually takes things.